Tuesday, May 8 marks Teacher Appreciation Day 2018 and in celebration of all the hard-working educators out there, businesses are taking notice. Below are 10 freebies and discounts teachers can take part in this year. The pizza chain is offering a free adult buffet to teachers on May 8. A valid school ID and coupon are needed to redeem their offer. This deal is for dine-customers only and a drink is not included. This deal cannot be combined with any other discount or promotions. 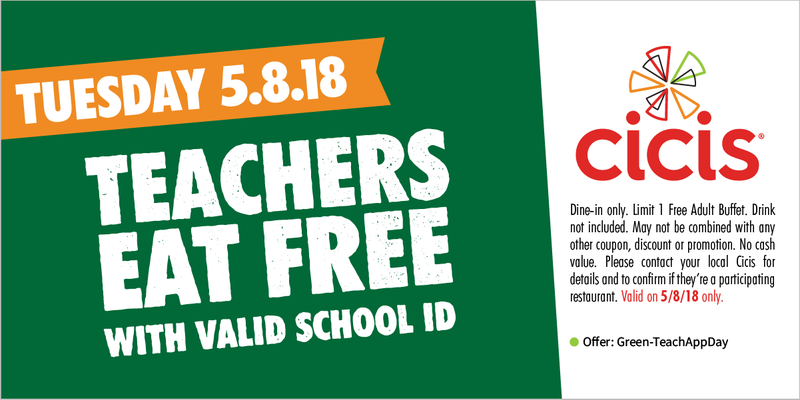 Teacher, as well as nurses, can get 50 percent off their entire food order when they dine at a PDQ restaurant on Tuesday, May 8. A valid ID is required to participate. Educators can receive one free burrito, bowl, salad or taco order with the purchase of any entree of equal or lesser value from 3 p.m. to closing time on Tuesday, May 8. This offer is valid for in-restaurant customers only and is limited to one free entree per teacher ID. Educators are always offered a discount when they shop at A.C. Moore, and not just on Teacher Appreciation Day. Teachers can receive 15 percent off their purchase anytime they shop by presenting their school ID, pay stub, homeschool affidavit or current state issued educator license. Michaels gives teachers 15 percent off their entire purchase, including sale items, each time they shop. This coupon can only be used for in-store purchases and a valid ID is required. Some exclusions may apply. Teachers and college students can get 15 percent off their in-store purchases at J.Crew, J.Crew Factory, and J.Crew Mercantile stores when they show a valid school ID. Teachers who sign up for LOFT Loves Teachers, which subscribes you to LOFT emails, will get up to 15 percent off their full-price purchases. Other bonuses include enrollment in a teacher-only sweepstake, access to annual LOFT Best in Class Grants, seasonal style guides and teacher appreciation nights. Teachers (including those who are retired) can receive 10 percent off at Hanes.com, Champion.com, OneHanesPlace.com, and JustMySize.com. You can verify your ID number and get an online shopping coupon here. Looking to buy a new pair of shoes? TOMS is offering students and teachers a 10 percent discount. Verify your eligibility here. Teachers can get a break when they move by using Budget Truck Rental. The company offers teachers 20 percent off on local moves and 15 percent off on one-way moves with the code "TEACH." See restrictions here.